Moon Cheri Pie - Chocolate Chocolate and More! 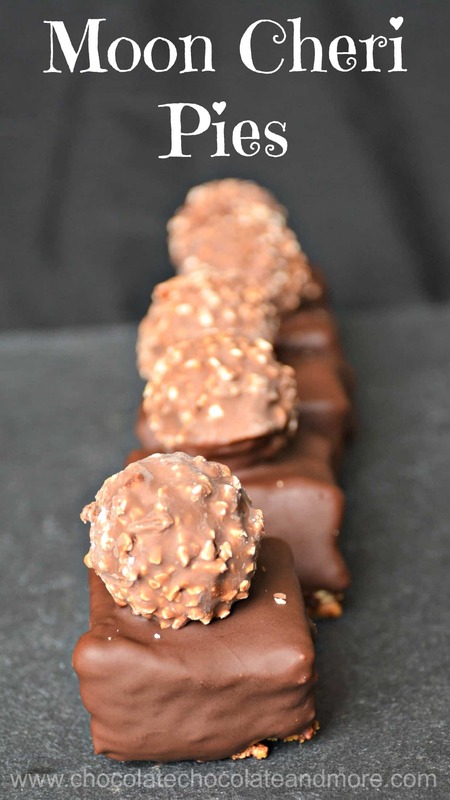 What do you call Biscoff cookies topped with coffee marshmallow enveloped in semi-sweet chocolate and garnished with a Ferrero Rocher candy? A bite of heaven? We call it Moon Cheri Pie because we’re smitten with this dessert! On Saturday, some friends and I had lunch at a cute little Mediterranean Market. I love this place. It has fun products that you can’t find in normal grocery stores and a cute little cafe with excellent food. While I was waiting in line, I saw some Moon Pies for sale. I haven’t had those since I was a kid. Since making marshmallows is really easy, I thought it would be fun to make my own Moon pies. 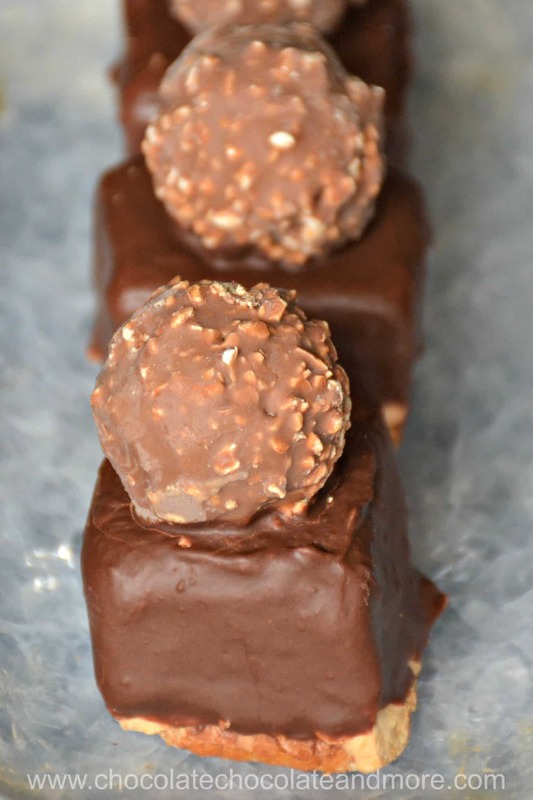 I had some Biscoff and Ferrero Rocher in the pantry and I recently made coffee marshmallows. So I was set. I lined my pan with the biscoff. Made the coffee marshmallow and poured it on top. I let it solidify over night so it was a little less sticky to work with. I then cut it into squares. 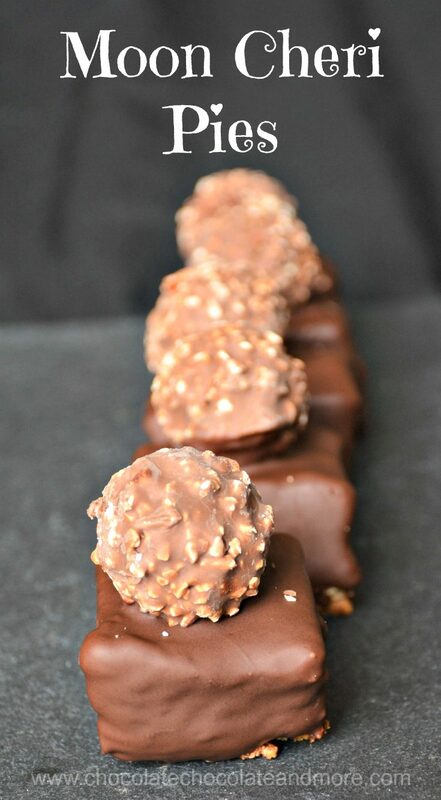 After dipping each into melted chocolate I topped them with Ferrero Rochers or candied pecans. So what do you call these treats. They weren’t Moon pies anymore. I asked my friends and they suggested some great names – Mon Cheri, Temptations, Swoon Cakes, My Fluffy Valentine. When I told them I was thinking of “over the Moon pie”, my friend Theme suggested Moon Cheri Pies. I love the play on words so Moon Cheri Pies it is! I’ll save “over the Moon pie” for another decadent treat. I hope you enjoy these as much as my friends did. Happy Valentine’s day! Put gelatin, warm water and instant coffee in the bowl of a stand mixer and attach the wire whisk. Line a 9 x 13" pan with aluminum foil. I put one sheet lengthwise and laid another width-wise over the top to make a cross. I left a couple of inches over the sides so that I could lift the candies out of the pan. Line the bottom of the pan with cookies. Then spray the sides with cooking spray. Spray a spatula with cooking spray as well. Place the sugar, salt, corn syrup and remaining water in a medium saucepan. Heat on medium high until the temperature reaches 240°F. Remove from heat. Turn the mixer on low to break up the gelatin. Then increase the speed to medium. Slowly pour the hot sugar syrup into the gelatin as the mixer mixes. Once all the sugar syrup is mixed in, turn the mixer up to high and beat until the outside of the bowl is a little hotter than luke-warm. Add the vanilla. Work quickly. Use the greased spatula to scrape the marshmallow off the beater (you won't get it all). Then pour the marshmallow on top of the cookies in the prepared pan. If needed respray the spatula with cooking spray and use it to smooth the marshmallow. Let sit uncovered until the marshmallow sets. This can be just a few hours but the marshmallow will still be very sticky. I let mine sit overnight. Lift the candy out of the pan and peel away the foil. Grease a sharp knife (I used a chef's knife) with cooking spray and cut the cookies apart. I cut strips and then cut each cookie in the strip. Then cut each cookie in half so you have squares. Mix chocolate and shortening together in the top of a double boiler. Melt, stirring until smooth. I made my chocolate in two batches because cookie crumbs tend to fall into the chocolate so a second batch limits the crumbs. Work quickly. Hold the Moon Cheri Pies by the cookie bottom. Dip into the chocolate coating all sides but the bottom. Set on a wire rack. 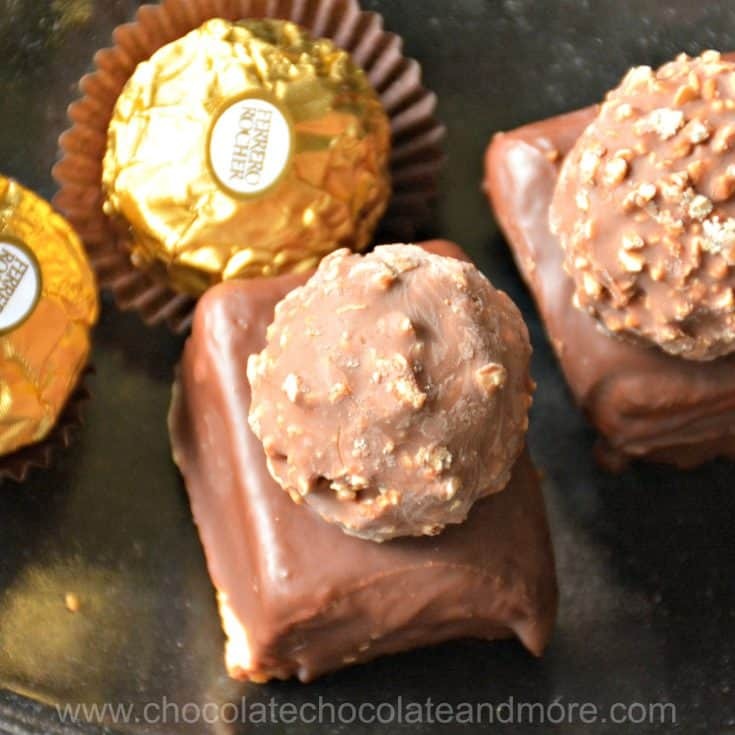 Top with a Ferrero Rocher or candied pecan. Some of my Moon Cheri Pies were a bit slanted on the top so the Ferrero Rochers slid off. I topped those with the candied pecans.